Walter Burkhalter-Director: Walter joined us in 2015 and has been in the library profession since 1990. Over the course of that time he has been the director of several libraries and library systems. In addition he served as the State Consultant for Public Library Administration and as an independent consultant. Jodie Porep-Youth Services Coordinator: “Ms. Jodie” has been with the library for since 2000. Patrons can see her daily working at her desk or involved in projects for our yearly Summer Reading Program. She lives in Fontana with her family. In her free time, she enjoys quilting and spending time with her grandchildren. Sally Lee-Library Assistant: Sally started working full time in March 2016 but has been working in the library system since 2011. She has BA from UW Whitewater where she took many studio art classes and minored in art history. She lives in Elkhorn with her husband Tom. Kayaking and grandkids keep her entertained these days. Along with the these 3 full time staff members, we have 4 part-time staff members: Kathy Bikowski, Susan Gilkes-Howell, Norma Gowlett, and Ann Reynolds: All of these woman can be seen helping patrons at the circulation desk or helping with many other library projects. Tom Whowell-President; Ann Catlow, Mary Kay Frazier, Joe McHugh, Mary Anne Pearce, Dolly Schneidwind, Sally Ratay, and Cindy Wilson. Adults, who own property, need to provide a valid driver’s license or state ID and a printed document with the property address (utility or tax bill). Children, 7 years or older, are eligible for library cards. Parents must provide the required documents listed above along with filling out and signing a registration card for each child. Seasonal renters or non-property owners please call the library for guidelines to obtaining a library card. Did you know the library accepts financial donations? Your gift to the library means the difference between a nice library and an outstanding library. It will be used in a variety of ways including improving library collections, adding new furnishings, and updating computers. The library also maintains a Giving Tree. Your gift will be recognized on the tree and will appear as a rock, acorn, or leaf depending on the amount of the donation. Make a gift if you want to invest in the library’s future, remember a loved one or family friend, or simply say “thank you” to your Library. Donations of, or on-going donations totaling, $5,000 or more are honored with a rock. Donations of $2,500 to $4,999 are honored with an acorn. Donations of $1,000 to $2,499 a gold leaf, $500 to $999 a silver leaf, $250 to $499 a bronze leaf, and $100 to $249 a copper leaf. To make a donation simply stop by the library or mail it in. 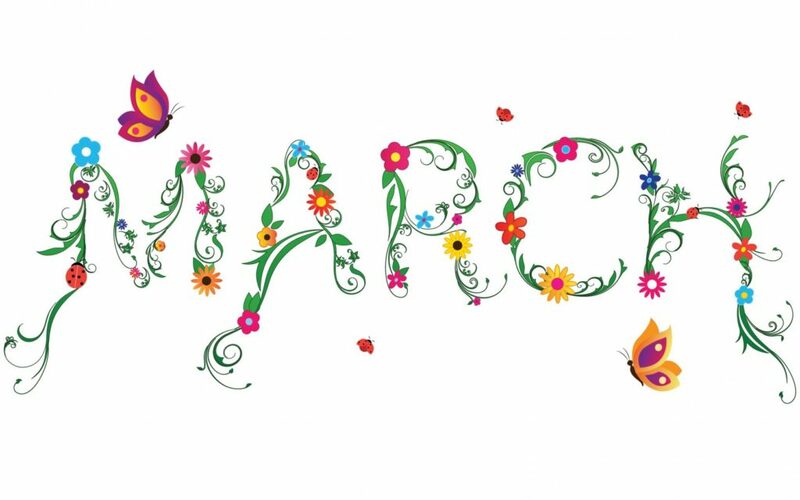 Be sure to let us know if it is a memorial or in honor of a person, group, or occasion. 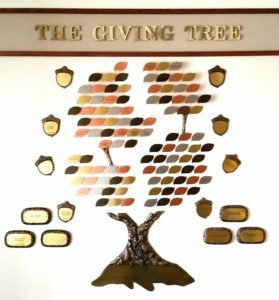 The Giving Tree is located by the entrance of the library and is just our way of saying thank you to those who have given to us. 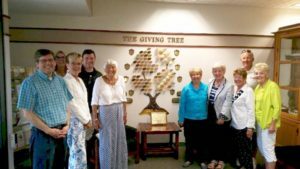 During the June 2016 meeting, the Library Board recognized, long time resident, Carol Lobdell, aka Gramma Carol, for her generous support with a rock on the Giving Tree. 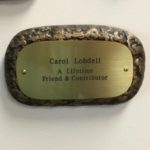 Carol served as Library Board President and conducted and assisted with story hours, as well as raising her family and maintaining involvement in many other community groups and projects. THANK YOU, GRAMMA CAROL.